As promised, I want to share with you the lovely items I've bought from other artists as part of the Stone Soup Challenge. 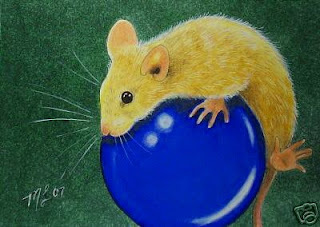 The mouse was the perfect gift for a dear friend from college. It's a long story that involves me rescuing a couple of mice from becoming a snake snack at a pet store while little kids looked on and then giving them — truthfully, dumping them on — my best friend, sneakily, while she was out of her room. Ummm... They multiplied. And I keep sending her reminders all these years later. I still wish I could have seen her face when she walked in and saw the cage sitting on her bed, but I'm really glad I wasn't there. My friend was delighted by the ACEO and reports that Melody Lea made her feel special by enclosing several extras with it. I know that she has been a dream to communicate with, and I'm enchanted by the way she captures the essence of the little animals and birds she paints. Please take a few minutes to visit her store. Bet you'll find something you like. 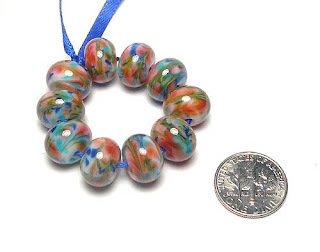 Next, I fell in love with these lampwork beads by Art by Lisi. This is her "Tropico" colorway, and the breezy island colors beckoned to me while we still had tons of snow on the ground and freezing temps. I have a special plan for these beads and will show you later. Lisi's beads are like candy: I want more and more. I'm sure I'll be a regular customer. She makes most of them to order, but it's well worth the short wait, and you know you're getting special attention, so please browse her shop. I know you'll find your own "gotta have" colors there. On the "buy local" front, I first met Abby and Bo Coffell of Entwined Designs at a holiday show last year. Bo makes lampwork beads, and Abby turns them into gorgeous jewelry — and has begun experimenting with metalsmithing, as well. Abby is becoming a good friend, and I'm looking forward to purchasing beads from them. And finally, I did a bit of bartering at Saturday's show. I've admired Vladimir Zhikartsev's work for years. I first became aware of him through the World Ice Art Championships held in Fairbanks every March: He's one of the top carvers with many awards under his belt, including the 2009 team 1st Place and People's Choice award in the abstract multiblock category for this piece. Besides being a world-class sculptor, Vladimir is also an accomplished painter, and I've been lusting after his work for quite some time. So when he offered to barter, I jumped at the chance to trade jewelry for prints. I chose two gorgeous framed pieces — this Birch Tree and another piece called Shallow Water. And in return, I'm flattered to say my jewelry will be headed to Russia as gifts for his family and friends. Next I'm planning to purchase more beads from Deborah Gregory of Sweetwater Designs. She's offering a "buy one, get one" sale in her Etsy shop until May 1, so hurry over and snap up some of her gorgeousness before it's all gone. Whew. Now I'm headed into Fairbanks to deliver some jewelry to New Horizons and the Artworks. [Edit: Didn't make it to Artworks; hope to get there Friday.] I plan to mail a package to Portfolio in Anchorage on Thursday, and I will have photos of new work up soon. It's easier now that we have all this glorious daylight! That's a funny little mouse story, I'm sure your buddy appreciated the mouse memento. Awww what an awesome selection of goodies. I do like those beads. And how exciting to have jewelry headed to Russia! Thank you for mentioning us. I will make sure to let you know right away when we do have beads available. I would love to see them incorporated into your works. Have a great sunny day and thank you for mentioning us. We still need to plan for another coffee meeting. SMILE! I'm happy to mention you guys. Your work is lovely, and I hope people are taking a look (and buying). That would make me really happy! As a practicing artist, and now finally emerging- I am having my first show in a "co-working space" here in Austin. The idea that people can work together to support each other through many careers and walks of life instead of against each other. The "against" business model has to go! :). I understand exactly what you are saying with "something missing"- now that I am in my studio more than ever I am alone all day, with exception of my son and boyfriend. Joining twitter, starting a blog.... I get to meet you and others, artists and those who appreciate art and be a part of a much larger community. This has encouraged me to photograph/document and start posting work today! Jayne, I don't know how I missed your lovely comment, but I do so appreciate it! I'm so far behind in posting: The near 24-hour sunlight has me itching to be outside instead of at the computer. Thanks for visiting!